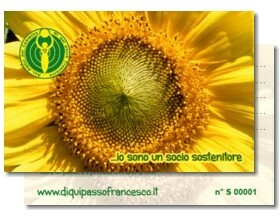 the annual rate is €10, renewable yearly. €1,000 gives the entitlement to: “A bed for life at the hostel in Assisi”, obviously respecting the hospitality periods and times of pilgrims and the various activities that will take place in the “Ruah… or the light breeze”, the hostel in Assisi. 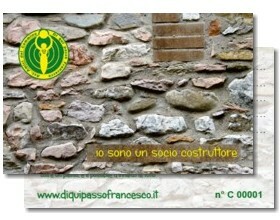 Builder Members’ enrolment in the “Società delle pietre vive” [Society of the living stones] will be legalised by means of a private deed. Send the registration form, duly completed, either by email or normal post. Pay the fee either by BACS payment or by completing a postal payment slip. The formalities to follow are shown below. The registration form remains in the archives of the association and will not be divulged in any form. The duly completed form must be sent as indicated below. 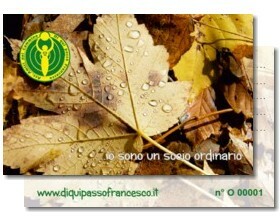 Beneficiary: associazione amici del cammino "Di qui passò Francesco"
The membership card (for ordinary members, this will not be changed each year, but will be renewed on payment of the annual fee). A sticker for your car (it’s good to be proud of your memberships!). … and that change of vowel in Italian means everything! The founder members thank you and… welcome you with open arms.